MAS members were given a once in a lifetime opportunity to excavate outside their headquarters last weekend. 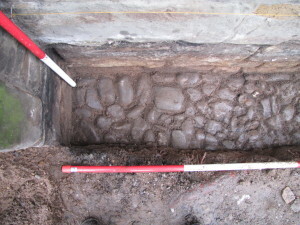 RBC are installing new pavements along Long Street as part of a Heritage Lottery improvement fund. 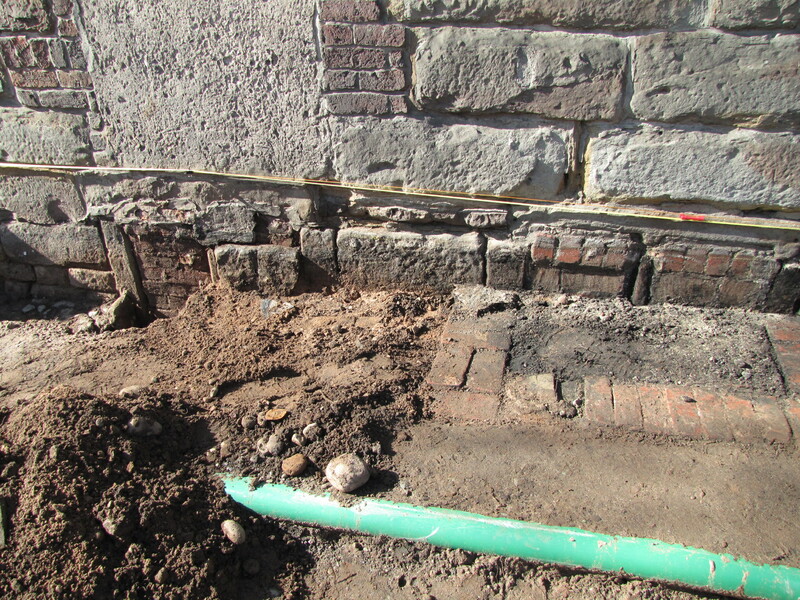 Their contractors kindly let us dig several trenches along the pavement before the new slabs were laid. 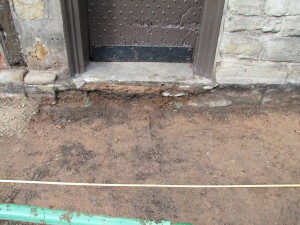 We found the old cobbled pavement about 450mm below the current level, It looks as fine as it does on the 1870 photo. 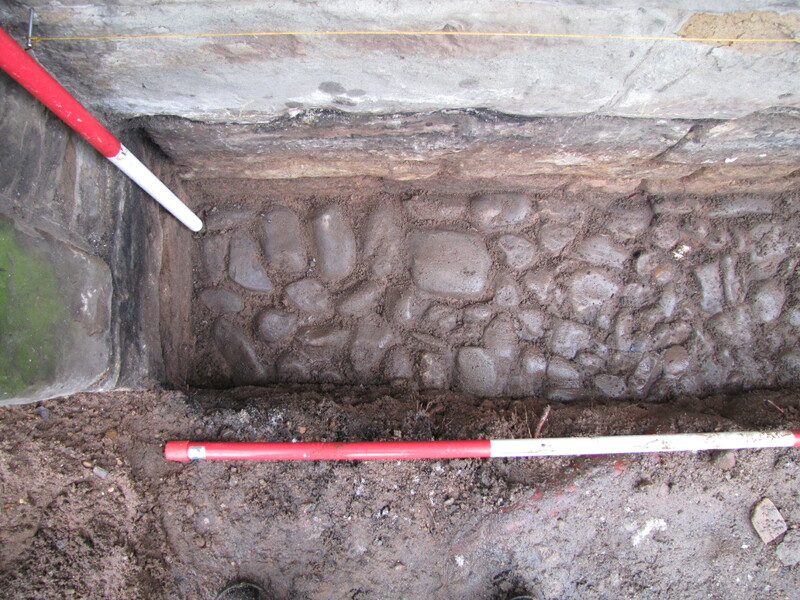 We also confirmed that the pub was once two separate buildings. 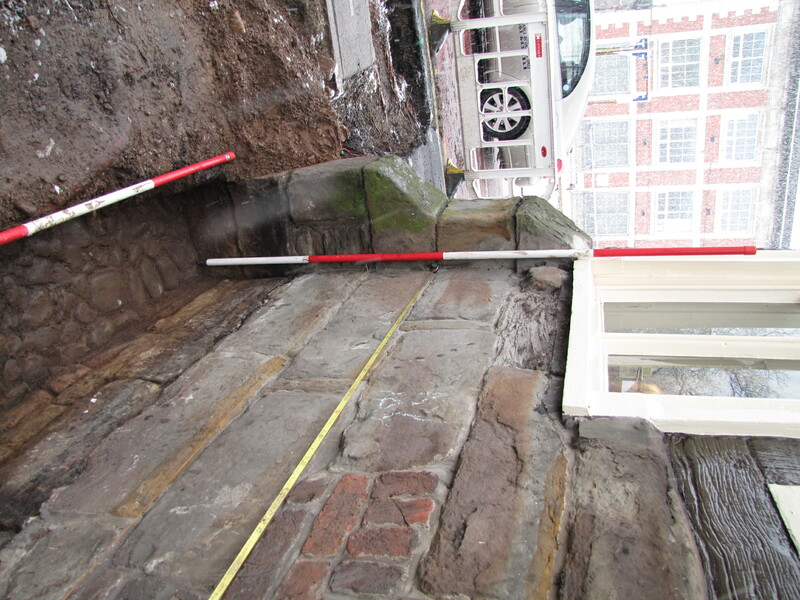 The recent tree ring dating survey confirmed the timbers between the right hand side of the front door and the sessions room were dated 1622 whilst those on the left up to Durnford Street were mostly 1654. The centre gable was probably a later addition to the building. The original sketch was done as part of a 1970’s survey by a Middleton buildings expert WJ Smith. When we examined the area under the door we noticed that the two sets of foundations stopped (indicated by the green pegs in the photo) the area in between was filled by soil and sand. 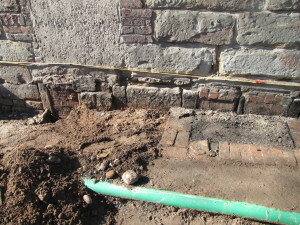 This is the only part of the foundation that is missing and could suggest an early passageway between the two buildings. 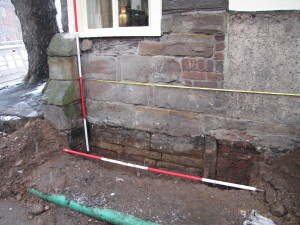 The bricked up remains of two stone lintel and mullion windows identified in the foundations of the 1654 building prove it was built with a cellar. The cellar is accessed through a trap door in the pubs lounge and is optimistically referred to as the “dungeon”. Clearly there is no evidence of cellar windows in the early building. This suggest that the current beer cellar was a later addition to the 1622 building. There is a bricked up doorway above the left hand cellar window. The door appears on some early photographs and it clearly covers up the window light. We hope to publish a full report on the weekends investigation later this year. Several members of the society are researching documentary evidence of the buildings owners and tenants which should help to interpret the physical evidence we have found.